The following is a list of meeting schedules for the Borough of Freehold. 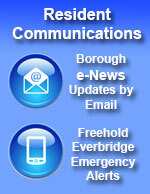 All meetings are held at Borough Hall, 51 West Main St., Freehold, unless indicated otherwise. Please check the calendar for updates. 1st & 3rd Monday of the month at 7:00 p.m.
1st Tuesday of the month at 6:00 p.m.
2nd & 4th Wednesday of the month at 7:00 p.m.
3rd Thursday at 6:30 p.m.